Assorted Aspen is a blog about Aspen Colorado events, activities and other things to see and do in our small but high-profile little town. While I often write about entertainment and recreation-oriented activities and events, I recognize that there are activities that also take place here that revolve around eco-friendly themes as well. I recently took part in one of these annual events. 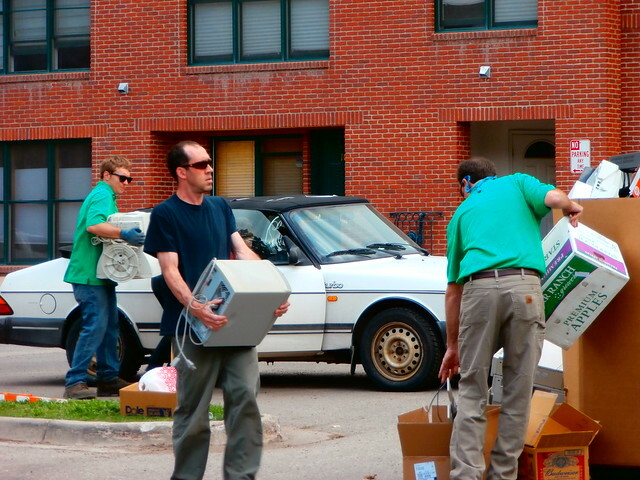 Last Saturday, City of Aspen Residents had the opportunity to drop off electronic waste at the Community Banks of Colorado parking lot for recycling. They were able to dispose of items like computers, monitors, laptops, tablets, keyboards, mice, servers, stereo equipment, old televisions, cell phones, printers, fax machines, telecom equipment, DVD players and copy machines. Local businesses were able to schedule commercial electronic waste pickups on the Friday before. The City has provided this opportunity since 2007, and this year, by using a new company, Electronic Recyclers International (ERI), they were able to do this free of charge. The City of Aspen has scheduled a similar electronic waste recycling event on August 25th, for residents and August 26th, for businesses. In the meantime, residents and businesses are encouraged to take their electronic waste to the Pitkin County Landfill for recycling. When I got down to the electronic waste recycling area, the ERI employees were working hard, and they had received so much material that they had to rent an additional U-haul to haul it all off! I dropped off a couple of old laptops, a printer and a UPS. It felt great to be able to de-junk for free while being environmentally responsible. Although the electronic equipment I dropped off was my personal no longer useful electronics, the company I work for, A Squared Search and Social Marketing, will some day have e-waste to get rid of – we just moved into our new office a couple of months ago. We plan to take advantage of this electronic waste recycling event next year. Recycling my electronic waste reminded me about some of the other eco-friendly Aspen Colorado events that take place every year. Two that come to mind are the Aspen Eco Fest and American Renewable Energy Day (AREDAY). AREDAY has evolved into an important national and international renewable energy technology and policy event, featuring many well-known national and Colorado-based presenters and speakers. It has also become one of the most celebrated annual Aspen Colorado events. Although I have not yet attended an AREDAY event, and have in the past only briefly investigated the Aspen Eco Fest activities, I plan on making a concerted effort to engage in these exciting eco-friendly Aspen Colorado events this summer..
Aspen Colorado - It's the Off-Season, Now What?